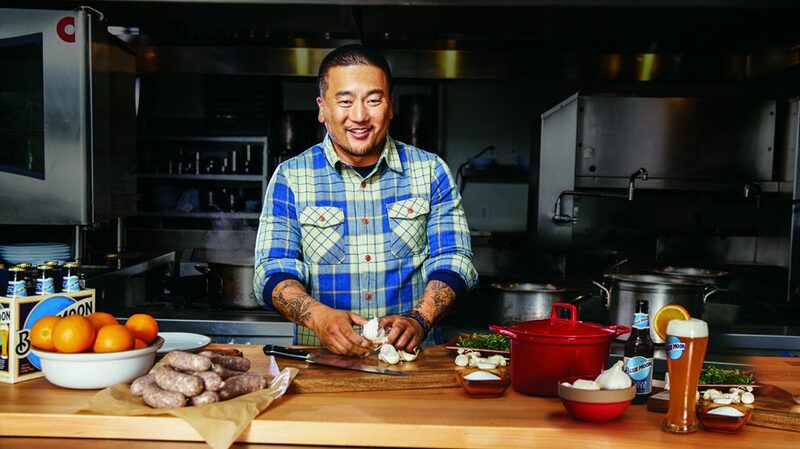 LA-based culinary icon Roy Choi, who strives to combine flavors in ways no one ever thought of, partnered with Blue Moon Brewing Co. to create some simple, yet unique culinary masterpieces. The celebrity chef’s Beer Onion Soup is comfort food at its absolute finest. Heat the onions, green onions, garlic and ginger in butter and oil over medium heat, stirring a lot until totally brown and jammy. Season with salt and pepper. Add beer and deglaze. Add stock and cook for a long time until delicious. Add a splash of cream and the chopped herbs, throw a bunch of old toasted bread in there with a splash of beer on top, and devour.